Noisy furnace or air conditioner? Air that is too dry or humid? There are solutions! The first step is to pinpoint the precise cause of your problems with our Whole-House Comfort Checkup. If your house provides enough fresh air ventilation. How to make your house more comfortable, and lower your utility bills. How to reduce respiratory allergy suffering. How to keep outdoor dust and pollen out of your home. 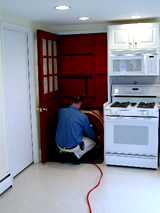 Installation of the "Blower Door"
First, a Kentwood Plumbing and Heating Home Comfort Technician will vsit your home. He will place a "blower door" in an outside door of your house. Then, using advanced diagnostic instruments and testing procedures, he will provide you with a personalized plan to solve these problems... permanently. Call us today to schedule your home checkup! Get more info on the Comfort Checkup from the Comfort Institute.